Fetlar cafe will be open until the 28th August, which will mark the end of an eventful 2011 season. Both the peerie taste of Fetlar weekend and the auditions day for Between Weathers saw large numbers of happy customers well catered for by the ever cheerful cafe staff. To mark the end of operations there will be a buffet lunch on the 28th August. Served between 1pm and 3.30pm the buffet will include: Soup, hot and cold savouries,pudding, cakes and fetlar ice cream. the charges are a very reasonable £7 for adults and £4 for children. Booking if coming from outside the island is essential. Please see our Cafe page for details. If you are visiting Fetlar after the 28th August. the Fetlar Interpretive Centre is open regularly until the end of September and on demand by prior arrangement during October and November. It offers Tea, Coffee and Hot Chocolate. 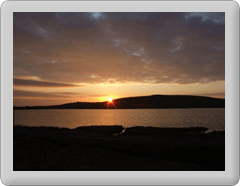 Food and drinks are available from Fetlar shop and there is now a drinks and snack vending machine located within the ferry waiting room at Hamars Ness which is available 24 hours a day.